At GDC yesterday evening Google unveiled its game streaming service. The new service, dubbed Stadia, will come on line later in 2019. Google boasts that when Stadia goes live gamers will "be able to access their games at all times, and on virtually any screen." Because Stadia is based in the Google Cloud backed by "nearly unlimited resources" consisting of "server class GPU, CPU, memory and storage," you won't need a PC or console, or to wait for downloads. Stadia will work on the Chrome browser you already use, or Chromecast or "any type of screen," such as TV, tablet or mobile phone, according to Google. Despite not needing any particular hardware on the client side - Google didn't unveil any 'box' yesterday - it aims to be able to stream games in resolutions up to 4K and 60 frames per second with HDR and surround sound. Google reminds us of its massive resources in the cloud "more than 200 million people watch game-related content daily on YouTube," it says. With Stadia it plans to allow this audience to become participants in many of those games "at a touch of a button". 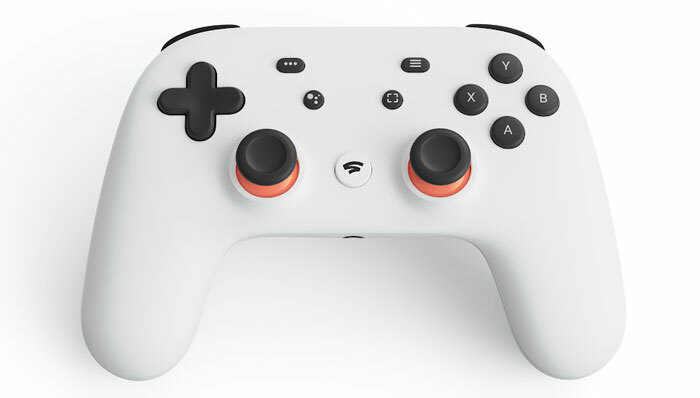 Though there isn't a consumer Stadia box, Google thought it necessary to produce the Stadia controller. As pictured above, the controller includes buttons, pads, thumbsticks – just like one would expect of a modern games controller. Google says it connects via Wi-Fi for the best performance, and there are handy buttons for instant capture, saving and sharing gameplay in up to 4k. Last but not least there is a Google Assistant button and built-in microphone. AMD is very happy to be Google's GPU partner for Stadia. Lisa Su was hobnobbing with Google execs before the GDC presentation, and AMD published an official blog post about Radeon GPUs and developer tools being used in the "Vulkan and Linux-based Google Stadia." Furthermore,it is claimed that the AMD and Google have been working on Stadia "for years". 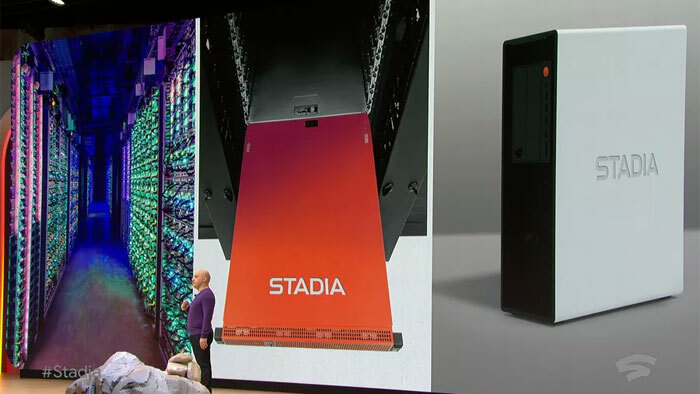 Stadia server specs were shared during Google's presentation, as above. You can see that the custom AMD GPU is similar in makeup to the Vega 56 for desktops. There's a custom x86 processor, which looks like an Intel part from its description. Lastly, the 16GB RAM pool with "up to 484GB/s" will probably include 8GB HBM2 on the GPU side. The result is that a Stadia machine in the cloud at your disposal is nearly twice s fast, in GPU teraflops terms, as the best games consoles available today. Illustrating the power available, one of the first games to launch on Stadia will be Doom Eternal which will support up to 4K resolution, HDR, and 60 fps game play. Google Stadia will launch in the U.S., Canada, U.K. and much of Europe "later this year". Could be exciting. Wonder if Steam will follow suit this year too.. Fingers crossed. CPU is explicitly mentioned as custom, the GPU isn't, so it's very likely to be a plain old Vega 56, binned for higher clocks. Are Intel doing custom CPUs? Most likely this is a Zen of some sort, but the clocks seem low. There is a suggestion that this is a custom APU on 7nm, a shrunk Vega 56 + CPUs, the L2+L3 figure is very odd for AMD, supporting the custom aspect (8MB L3, 256KB L2 on 6 Zen 2 cores?). It'll be great….on a 10gbit fat pipe within 20miles of a server. CPU is most likely part of an Epyc chip, I would expect the hardware to be 2u servers with Epyc CPU's and 4 Instinct cards.